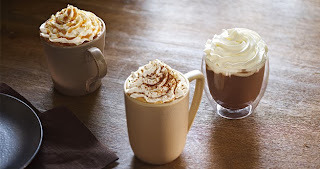 Check out the Fall Beverages available for a Limited Time, Pumpkin Spice Latte, Salted Carmel Mocha & Chocolate Chai. Some things are undeniably fall: colourful leaves, cable knits and, of course, rich fall flavours. Now’s the time to wrap your chilled hands around a warm Pumpkin Spice Latte or a rich and creamy Salted Caramel Mocha. Or try our new Chocolate Chai Tea Latte, a chocolaty twist on a classically smooth fall weather favourite. Fall beverages are back for a limited time.